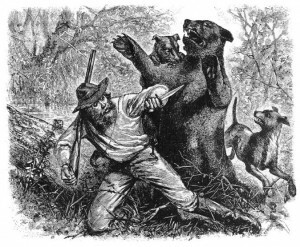 Hugh Glass’s encounter with the grizzly bear was depicted in illustrations soon after it was first reported. Wikimedia Commons. A series of posts edited by Ben Bryce & Daniel Ross on The Revenant and Hollywood History. Product of ActiveHistory.ca Film Fridays and of a roundtable on the film held at the University of Northern British Columbia in March 2016.